Today we are honored to have Kate Elliott over as our guest for the day. Kate is the author of amazing fantasy fiction (we are huge fans of her Spiritwalker Trilogy), and we’re thrilled to have her here to talk about fan art and how it led to her writing a new book. Please give a warm welcome to Kate Elliott, everyone! I’m not alone in loving fanart, as I know because I see my writer friends with great delight linking to art depicting characters and scenes from their books. In fact I love seeing fanart drawn for the worlds of friends of mine as much as I love seeing fanart drawn in one of my worlds. Because the medium is different and because I am such a visual person, art makes everything pop for me. It is also such a lovely tribute to characters the reader has enjoyed. 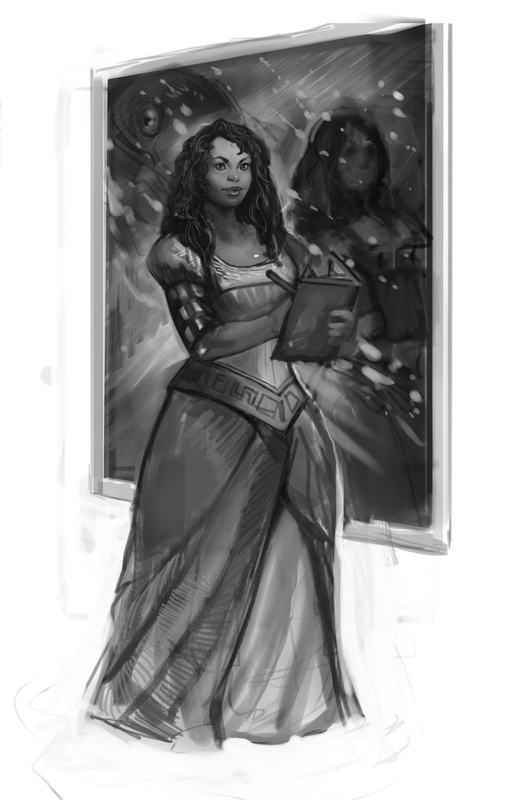 The first piece of fanart for the Spiritwalker books I saw was this wonderful piece by Anna Davidson. Later, fanart showed up on Tumblr, but if the artist hasn’t deliberately drawn my attention to it then I try not to intrude. As with fanfic, fanart isn’t actually about me or for me; it is a way for readers to interact with the story they’ve read and share it with others. That’s how I see it, anyway. The existence of fanart for the Spiritwalker books inspired me to create a fanart-style project of my own. The main character and first person narrator of the Spiritwalker books is a young woman named Cat (Catherine). Her best friend is also her cousin, Bee (Beatrice), whose adventurous story unfolds alongside Cat’s but often “off-stage” from Cat’s journey. I had long contemplated a story “as told by” Bee, detailing her own adventures. Bee is not a shy or retiring personality and I knew she would have lots to say and that she would tell her story in a way different from Cat. Because Bee is an artist who carries her sketchbook with her everywhere, it made sense that any story she told would be accompanied by illustrations “as drawn by” her and with an emphasis on the things Bee finds most interesting, which are good looking young men, kissing, and “natural history” (as she would call science). The Secret Journal of Beatrice Hassi Barahal turned into a short story of about 6000 words (written by me) accompanied by 29 illustrations drawn by the fabulous artist Julie Dillon. It is my first self publishing venture, one that I entered into not with any intention of making money (I’m hoping possibly to break even once the pdf version comes out) but simply because I wanted illustrations of the characters, something I could share with the many readers who have read and enjoyed the Spiritwalker books, sort of a “thank you” to them. I hasten to add that no one is required to take these versions as absolute, that this is the way you or anyone *must* visualize the characters. It’s my belief that part of the interaction between reader and story is the way readers’ imaginations create the characters in their head, and that whatever that may be is right for them. What I learned from doing this project is that creating a solid looking print volume has a lot more levels and complexities than I had realized. This was true even though I paid other people to do the parts of the work I had no experience in nor time to learn, which is pretty much all of it. First, I had to make the decision to really go ahead and do it. That in itself wasn’t easy because I kept telling myself why it would be impossible. I also had to decide whether I could afford the initial outlay, because from the beginning I intended to pay people for their work rather than asking for volunteer labor or offering people a chance to work for me in exchange for visibility. The most important step was to find an artist. My daughter suggested Julie Dillon immediately. I also asked Lauren Panepinto, the art director of Orbit Books, if she had any suggestions of young up-and-coming professional artists in the early stages of making a name for themselves because I knew I could not afford a fully established artist who has been around for years. I also wanted a younger artist because I felt a younger hand might work better for the project. Lauren’s list of a dozen young artists included Julie Dillon. Being a person who always looks coincidence in the face, I decided to approach Dillon first. Being me, I then went through weeks of hesitation, sure that no one would want to work with me and that if I asked I would just be told “no.” I struggle with this sort of self doubt constantly, and I mention it in public in case anyone else out there struggles with self doubt. It’s a thing, and it’s real and difficult, so I like people to know that in my experience it is possible to continue to write (or accomplish whatever endeavor) even as you wrestle with fears and anxieties. When I finally emailed Dillon, she responded with an enthusiastic “yes” — and my timing was excellent because only a few weeks later she was nominated as a Finalist for the Hugo Award for Best Artist, the first woman since the 1980s to be so nominated. I explained what I wanted, and Julie met her deadline with the 29 aforementioned and entirely wonderful black and white illustrations (hers was the only deadline met in the entire endeavor, in fact, a sign of her professionalism). By this time I had a finished draft of the story, so I turned the story and the illustrations over to my daughter Rhiannon who works as a print estimator and who is co-publisher (with Melanie Ujimori) of a micro press called Crab Tank that publishes Tankadere, an annual comics anthology, as well as one-off projects. She knows her way around layout, design, and actual printing. The page count and binding of the chapbook had to be confirmed because as a short story it has more of the feel of a chapbook (or short children’s picture book) than a paperback. We went back and forth over: whether to do staples or glue; the actual size (6 x 9); the cover; the estimated print run. Fortunately she knew a printing house in Portland she wanted to use whose work she trusted. Due to a family illness this part of the process ended up taking far longer than expected. A designer did the preliminary layout. I commented on it, my daughter did revisions, and I did bits and pieces of rewriting as we moved text and illustrations around and as I insisted that the picture of the romantic lead had to be larger. No, larger. The first unbound “proof” copy came off the press in late July. I do not consider myself a perfectionist, but we went through four “proof” versions before we decided that we had done everything we could and caught every possible mistake we could find and had a version we were willing to see go to press. I sweet-talked a publishing professional who had also read Spiritwalker into proofing the story in exchange for a free copy. Proof-readers and editors are your friends. This entire process ended up taking about five weeks due to travel and work and (see above) family illness complications. The chapbook was printed, and I announced that the print run was available on my blog, Twitter, Facebook, & Tumblr, which are the main places where I hang out online. Melanie gave me advice on proper packaging methods so that the book would arrive safely and unmangled, and she and I bought all the things, put the book into plastic sleeves with a chipboard backing for stability, addressed envelopes, and went to the post office. The print version is available to order via the Crab Tank website. A pdf is almost done, lacking just a few technical issues, and then it will also be available via Crab Tank. The Secret Journal of Beatrice Hassi Barahal functions as a sort of coda to the Spiritwalker Trilogy. The timespan covered in its 36 pages encompasses all three of the Spiritwalker books as well as extending a short span beyond the end of the trilogy. I tried to make the story work alone but obviously it is full of spoilers and works best if you already know the characters. If I must say so myself, the illustrations are magnificent. In honor of this exciting first in my professional life and to mark the completion of the Spiritwalker Trilogy (and its coda), I am offering a Spiritwalker Giveaway, kindly hosted by the most excellent Book Smugglers Thea and Ana. The entire Spiritwalker Trilogy (Cold Magic, Cold Fire, Cold Steel) in trade paper format, a paper copy of the Bonus Chapter 31.5 (fits with Cold Fire), and a copy of The Secret Journal of Beatrice Hassi Barahal. All signed by me (can be personalized if the winner desires), and the Secret Journal is also signed by Julie Dillon. There will be two sets given away, one domestic USA and one International. To enter, use the form below. GOOD LUCK! I love Apofiss from DeviantArt – here is an example. 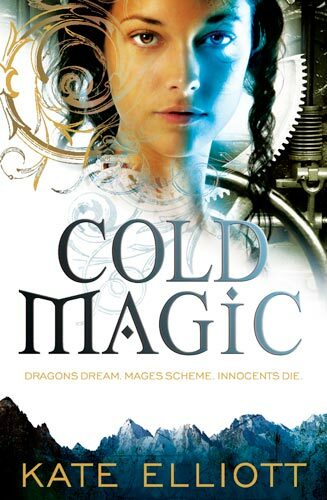 I’ve read Cold Magic and have been longing to get my hands on the rest of the series. I love oxboxer on deviantart. Right now, my favorite artist is Noelle Stevenson. Her art always has a sense of movement and life, and she has a great eye for color. 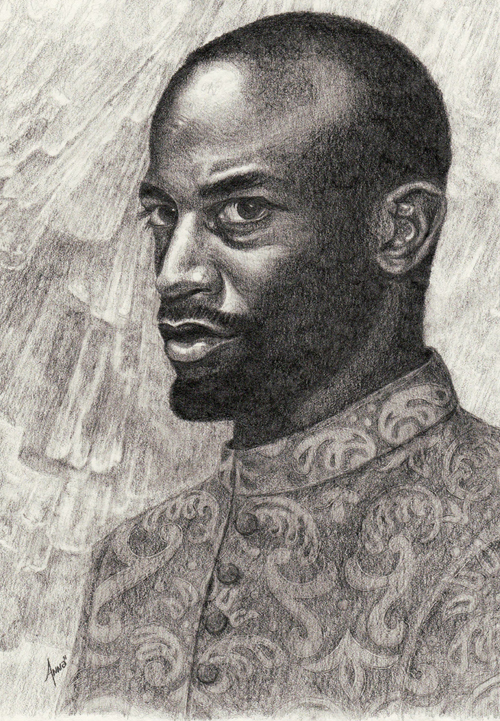 Definitely James Jean, his Fables covers are works of art. Whoops pressed enter too soon! Definitely James Jean, his Fables covers are works of art. I’m actually a big fan of Julie Dillon. She was on my blog once which was a huge deal for me. I also love Rebecca Guay, Gregory Manchess, Kinuko Craft, Aly Fell, and Galen Dara just to name a few. Thanks so much for the giveaway! My favorite artists are John Romita Jr. and Alan Davis. I really like blindthistle fan art (especially for cinder and scarlet). My favorite artists have to be Katie Cook, who does the Gronk and My Little Pony Comics, along with a lot of adorable fan art, and Comfort Love and Adam Withers, who partner with having two amazing comic series, The Uniques, and Rainbow in the Dark. I really like looking at the bookshelf illustration in Colin Thompson’s How to Live Forever. For favourite artist I would go with Berni Wrightson whose artwork deeply impressed me in my youth, and though my interests have shifted some over the years I still love to see the stuff he did. My favorite is and will always remain my fantastic friend, Deda. She created a romance webcomic about piracy, The Pirate Balthasar. I adore it! I don’t have a favorite living artist but I do enjoy James Jean’s work on the Fables covers and elsewhere. I’ve recently discovered the art of Meredith Dillman, which I love. The Secret Journal is astonishingly pretty. I haven’t read it yet: I’m almost afraid to touch it, it’s that lovely. I love fan art–especially book fan art. My recent favorite is tumblr user Simini Blocker. My favourite fan artist is minuiko – she does the most amazing art for Tamora Piercec’s work; it’s gorgeous! My favorite artist is Wangechi Mutu. Amazing contemporary art! I love seeing people’s fanart. Maybe because I can’t draw a ruler with a straight line but some fandom artists are amazingly talented. Uh, Julie Dillion illustrating Kate Elliot? Where do I sign up? Right now, I’m a huge fan of Minuiko, who does lovely illustrations of Tamora Pierce’s work. Currently my favorite professional artist is Gene Luen Yang. That may be because I miss Avatar so much right now, and I am enjoying his comics immensely. I am not sure that I have a favorite. Currently, I really like Chris Ayers’s Daily Zoo because the creatures can always make me smile. I hope your self publishing venture is a total success. I am waiting impatiently for the eBook version. I am amazingly ignorant about art and artists – especially artists. Though I just read the Moribito books and really liked the illustrations in it a lot. I love this idea – chapbooks and copybons are great ways to self-publish, IMO (although I say that as a consumer and not someone who has to go through creating them!). Personally I love C. Lijewski – MediaViolence on deviantart and discordia on tumblr. I have a few of her copybons/art books, and they’re fantastic! My favorite artist is Noelle Stevenson, aka Gingerhaze. She does both original and fan art that’s always quirky and funny. I don’t really have a favorite. I’ve always loved Makani’s Harry Potter fanart. Right now I am really enjoying the Portly Princess art on tumblr. I’m not a visual person, so I don’t really go out of my way to figure out what characters look like. In fact, I prefer to have a nebulous visual idea in my head of who they are; that’s why I really don’t like watching film versions of books I’ve enjoyed. I honestly can’t think of a single ‘favourite’ artist. I really should be able to- I talk art all the time with my boyfriend, who’s currently doing a BFA in Studio Arts. I don’t have a favorite fan artists (too many amazing people), but I love the artwork of Brad Weinman, who did the cover art for Patrick Carman’s “Land of Elyon” series. The pictures are so dynamic that the characters, who are usually pretty static, are brought to life. Donato Ginacola leaps to mind for epic treatments, but I’m also terribly fond of Harry Clarke, the Irish illustrator. I have enjoyed a lot of fanart I have come across, but do not have any particular favorites. I tend to drift more towards fanart on specific favorite stories, than towards specific artists. I love Mary Grand Pre. My favorite artists on Tumblr are Noelle Steveson and Tyler Feder. On another note, why the heck in all this time has Jody Lee never been nominated for a Hugo? Her covers led me to a lot of DAW books, and in general a lot of books by women writers, in the first place, in the 80s. 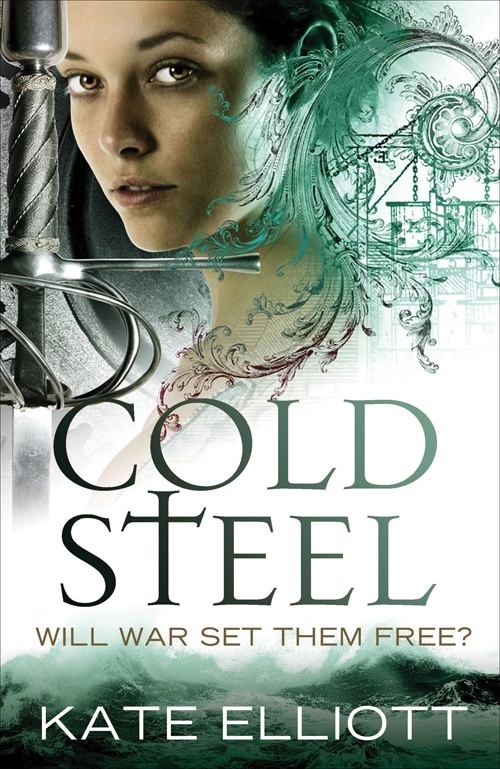 I adore her Michelle West covers for the Essalieyan series especially, but I also always loved her Valdemar covers. Went and ordered from your daughter’s site – if shipping to Germany weren’t so prohibitive I’d have ordered those Tankadere anthologies too, they look great. I’m a big fan of Banksy! I like the clean, graphic style and his satirical bent. As for fan artists, I really like Marko Manev. I love Kinuko Craft’s artwork. There have been several books that I only picked up because of her gorgeous cover art. Hmmm . . . I don’t have a favourite contemporary artist, but I do study book illustration, and of all the books I’ve looked at, I would have to say the Tenniel’s illustrations for Alice in Wonderland are the most magical. There are so many wonderful artists, but one artist that I have several pieces of is Amy Brown, so I guess you can say she’s my favorite. I’d like to mention Echo Chernik as well, she’s so awesome. I don’t have a favorite fan artist. I would say one of my favorite artists is Dale Chihuly. The one that pops up in my mine is the illustrator for The Rithmatist – Ben McSweeney. All the illustrations for that book really add to the story. Kinuko Craft‘s book covers are stunning. My favorite artist is Yulia Brodskaya. She does awesomely awesome work with paper, mostly in the form of quilling, and I wish I could do that. I like Ursula Vernon’s work. don’t really have one. I’m not really into visual art. More the written art 😉 Thanks for sharing! I don’t really have a favorite artist. I do like the work of Alphonse Mucha which I learned about this semester in History of Graphic Design. His work is amazing and its crazy how his style has influenced art to this day. I’m a huge fan of David Aja right now. Micheal Whelan has been one of my favorites for years! Degas. I love the dancers. I tend more towards favorite composers (Ramin Djawadi and Jesper Kyd) than artists, but currently my favorite is probably Aaron Diaz. He has an amazing sense of style. I have two actually. One is Jody A. Lee, who also did the covers for Kate’s Crown of Stars series. I love her style and she’s illustrated some of my favourite authors, such as Kate, but also Mercedes Lackey and Fiona Patton. The other is Joey HiFi, who is genius in my opinion. I love the covers he did for Lauren Beukes, Chuck Wendig and Jurassic London. My favourite artist (still alive) is Paul Carrick. And he’s a nice guy, too. My favourite artist is Paul Klee. Cory Godbey for sure. His lines and colours are amazing. I always loved Alan Lee’s illustrations for The Lord of the Rings, they just capture something so perfect for the books. I love Michael Whelan’s art too. And I have been loving the cover art on the Spiritwalker (Peter Cotton I believe?) and the Crossroads (also by Kate Elliott) trilogies. Cover artist like Dan Dos Santos and Tony Mauro. I also enjoy works by Amy Brown and Nene Thomas. anyways i’m enjoying seeing all these responses and will have to check some of the people out! My favorite artists that I have seen in my favorite books are Charles Vess, Michael Whelan, and Ana Juan all of these artists have add the perfect atmosphere in the books they have illustrated/done covers for. My favorite fan artist is probably viria (on tumblr/deviantart). She draws art from a lot of my favorite fandoms and I just love her style! I think my favorite illustrator is Brian Selznick – not only is he a wonderful artist, but he’s a fabulous storyteller as well. As far as professional artists go, it’s Marc Chagall, hands-down. Swirly, whimsical, dark, romance – the man knew how to paint a picture, that’s all I’m saying. My favorite artist is actually a team: Zelda Devon and Kurt Huggins of Teetering Bulb Studios. Here’s one of my favorites. Dan Dos Santos has beautiful art, which has helped me discover several good books too! The artwork looks beautiful. I don’t really have a favorite artist, but I’m going to be paying attention to more fanart from now on. I’m not sure how many of you are Potterheads on here but there’s an awesome artist called Makani who used to do side-splittingly hilarious sketches of characters from the wizarding world of Harry Potter. She had a site called acciobrain.net but I searched for it recently and I think it’s closed down now unfortunately. She does do loads of other awesome art on DeviantArt.com, so if you search her name it should come up. Another digital artist that I really like is Charlie Bowater. Her pictures are always super dreamy and beautiful. You’ll find her on DA too! I don’t have a favorite artist but there is many different amazing fantasy fan art pieces out there! I’m very fond of Charles Vess’s work, and have recently been enjoying the artist for one of my daughter’s picture book series, Alexandra Boiger. I loved the Mary GrandPré Harry Potter book covers – she included so many details that you only understood once you had finished reading. I love the works of the old Dutch Masters. Minuiko is a tumblr blogger I recently discovered who draws lots of fanart for Tamora Pierce’s books, the Graceling series, A Song of Ice and Fire series, Harry Potter series, and the Queen’s Thief series. I do love those images that Kate Elliott has shared here. I need to finish up her series soon! Thanks for the giveaway! My favourite is Joe Benitez, mainly because of Lady Mechanika. This is amazing! I love love love these books and think its so exciting and lovely that the author has had this professionally put together! As someone who works in illustration I think its a fantastic idea – I wish more people would create something like this! My absolute favourite illustrator/artist is Rebecca Dautremer. I have no idea who my favourite artist or fan artist is, mostly because my tastes vary and I never remember names. I love Van Gogh’s work, but on a casual level and I don’t know enough about him to really call him my favourite. This is my comment about entering the giveaway. There are many like it, but this one is mine. P.S. Yes! Really, really want this! Love the Spiritwalker books! Hrm. Not exactly fan art, but I’ve got a soft spot for the old (1980’s) D&D artwork. I think I missed what I was supposed to say in my comment…sorry! One of my favorite artists of recent times is Sam Spratt. He usually doesn’t do fantasy, but his art is amazing and he’s an encouraging person overall. My fav artist Van Gogh, without a doubt. I’m rather fond of Stephanie Pui-Mun Law. And Marta is a great Harry Potter artist (I think she does more than that now but that’s where I remember first coming across her stuff and loving it). Oh and I agree with whoever said that Degas’ work is lovely (the ballerinas!). I like many artists, but am bad at remembering names. I hadn’t been too interested in fan art because I don’t like having my view of a character influenced. But there are so many talented artists, I’m developing an appreciation! Hmm, I don’t really follow any current artists, but my favourite artist from the past is Monet. My favorite fan artist is Alice X. Zhang, as someone else said. Her Disney wallpapers are on every device I own. So gorgeous. Ooh, I’ve been dying to read this series! I’m a huge fan of Kathleen Jennings (nominated for a World Fantasy Award this year) – I’m lucky enough to have worked with her as an artist and writer, and thing she’s just marvellous! Who is your favorite artist (fan artist or professional)? Hrm. Ben Templesmith, I think, for graphic novels. Alice. X. Zhang for everything else, she’s utterly amazing. I wish I knew more about art tbh, but Alejandro Guijarro’s photographs of scientist’s blackboards after teaching classes are very beautiful. This is a very exciting give away, and I love the full-circle interactivity between writing and art 🙂 There are some very talented fan artists who provide a visual window on our favourite characters as well as the authors written version. Thanks for the giveaway! Georgia O’Keeffe has always been a favorite artist of mine. Great giveaway! At the risk of showing my age, Alan Willow & Chris Achillos (who illustrated the early Doctor Who novelisations, back in the 1970’s) were great favourites. She’s a very versatile artist. I wish I had one favourite artist, but, since I don’t, I’ll name a friend, Kathleen Jennings. She has the most wonderful fairytale feel to her work, and I’m in fairytale mode today. I don’t have a favorite current artist. I do enjoy the work of classical artists. What a great give away! I love the work of Stephanie Pui-Mun Law. I like the works of Monet. I like this woman Andiree on Tumblr: http://spookyandiree.tumblr.com. She has some great Eleanor & Park fan art that I just love. I adore Stephan Martiniere’s work. He handles place so, so well. On another note, Kate Elliot’s words on fear and anxiety were exactly what I needed to hear today. Thank you. My favorite classic-ish artist is probably Vincent van Gogh, and my favorite modern artist is Polly Guo! (http://pollums.com/) She wrote a fantastic comic called Houdini and Holmes. Yay! I’ve always loved John Jude Palancar’s book covers. My favourite artist is Dan Dos Santos who does the cover art for Patricia Brigg’s Mercy Thompson series. The fantasy art of Alan Lee and Donato Giancola, also the imaginative illustrations by David Litchfield. What a fantastic giveaway! My favourite artist was Ralph McQuarrie, who did all the Star Wars posters and things. His art was fantastic and I could just stare at it for hours. Still have a fondness for David Mattingly who did the cover for Barbara Hambly’s Time of the Dark. My favourite artist is Alice X. Zhang as well. Bob Ross is my favorite artist. Not because of his works, but because I honest to go learned to paint by watching his show.